During the late 1960’s my family lived in Glen Oaks until I was three. One of the things I remember most of my short time there was this little burger joint that stood on the north side of Union Turnpike near the movie theater. It was dark inside, bluish purplish walls, counter on one side, tables on the other. Not the kind of place a kid would remember, except for the fact that it featured a model train set running on tracks delivering food to its patrons. In my memory the tracks ran all over the place. They went in and out of the walls, up and down, high and low, in and out. Memory exaggerates perhaps, but I’m sure but there was definitely a restaurant on Union Turnpike and it did use model trains to deliver orders to customers. Once my family moved out of Glen Oaks I never set foot in the Hamburger Coach again. There were eateries based on the same concept but they too closed, and I never was able to walk into another burger joint that delivered food to my counter via train. You never know when your last chance to get to do something may have already come and gone, and for me, food by train ended before I reached Kindergarten. 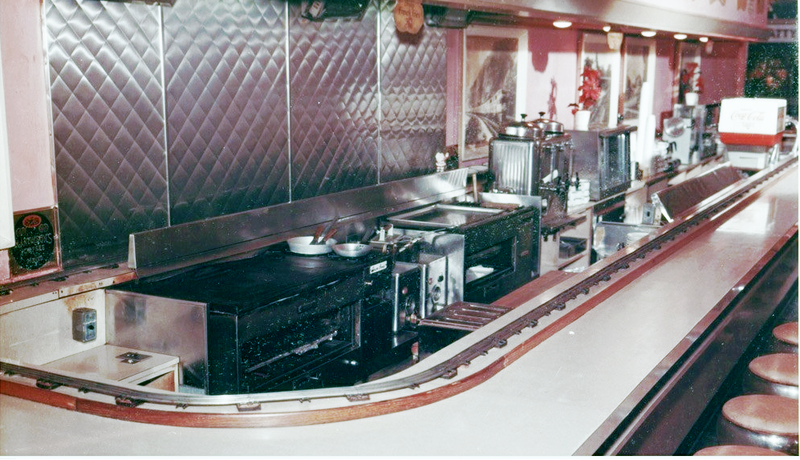 There were several train oriented restaurants operating in our area in the 50’s, 60’s and 70’s. 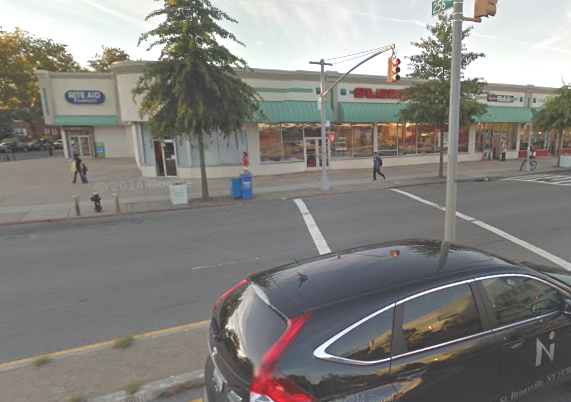 There was a Hamburger Train on Queens Boulevard in Rego Park, a Hamburger Express in Garden City. Hewlett had a Hamburger Local, Bayside and the Bronx had a Hamburger Express. 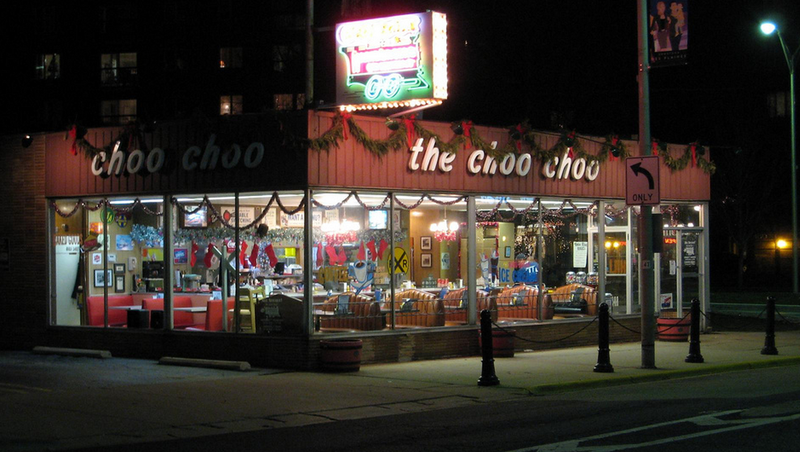 The most popular of these, and the one that seemed destined to outlive the others was the Hamburger Choo Choo on Main Street in Huntington. It was popular and had a reputation for having food that was quite good. It might still be open today if not for a grease fire which burned it down on March 20, 1982. It’s turn of the century wood frame building did little to help save it, and within just a few short minutes the treasured Hamburger Choo Choo had served its last burger. 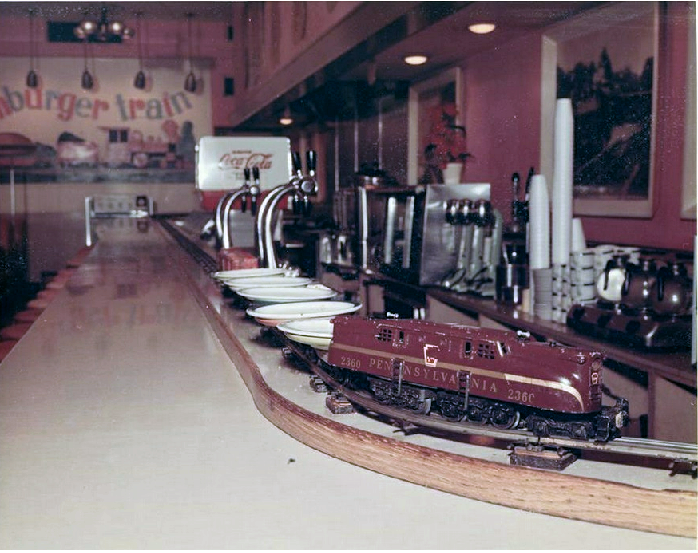 New York has been without a model train counter since, but the Chicago area has a restaurant that has been open for decades. 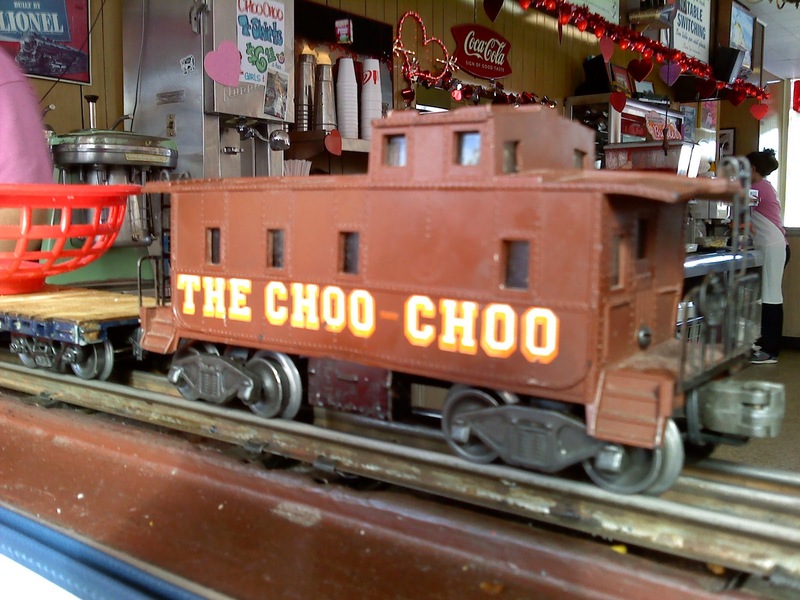 The Choo Choo, according to The Des Plaines Patch, was borne out of an idea that originated with World War Veteran Roy Ballowe. His brother James and wife Marilyn went with it and opened the Choo Choo. Their place has stood the test of time, and the concept is getting new life; The All Aboard Diner in nearby Downers Grove is now running a similar operation, with a train running all around its large double sided inner counter. For me, Downers Grove is about the same distance from NYC as Des Plaines, so my nostalgic stop for local food via express train will still have to wait. Ray Kroc of McDonalds fame opened one of his first McDonald’s in Des Plaines. It is said that Kroc paid a visit to the Choo Choo and assured the owners his fast food restaurant would be no match for theirs. I have not been able to find a photo of the Hamburger Coach in Glen Oaks. The only tangible documentation I found of the place was a help wanted ad for a waitress in March 1966. There are only a few photos of the other similar places that once existed in our region. 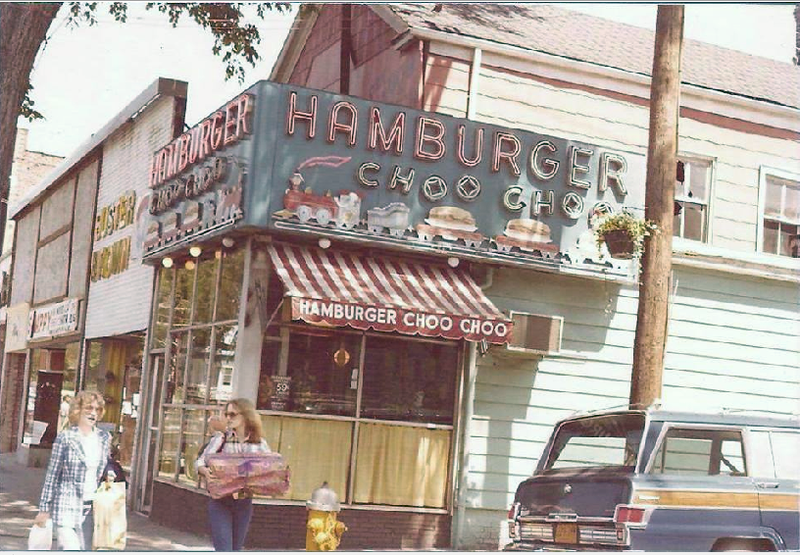 Hopefully someday someone will open a train delivery restaurant again in our area so we can relive the memories, or at least track down a photo of the Hamburger Coach. Below is a collage of some photos of the New York hamburger train places I was able to find. 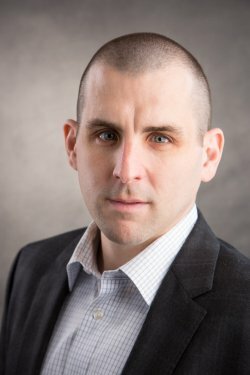 My brother (and bestselling author) Scott Berkun and I grew up together in the New York City borough of Queens, an area that is part city, part suburb. You might think that would make it the best of both worlds. But for Scott and I, we felt more like we were characters in “The Ice Storm” or “American Beauty,” lost and alone. We were trapped within the facade of a happy American family and we were desperate to figure out why it all wasn’t as wonderful as it should be. Scott and I are six years apart, but almost from the beginning we knew we had an affinity for each other that transcended any age difference. As we have both agreed since, something was keeping us apart when we were young. We were friends, but we now believe that the lack of a settled household environment kept us from getting as close as we could have been, which Scott points out in his book. We could have looked out more for each other if there was someone looking out more for both of us. I should have told him at the time how great he was. Scott, you’re smart, you’re cheerful, you’re funny, but I never told him. I didn’t have the self-confidence. 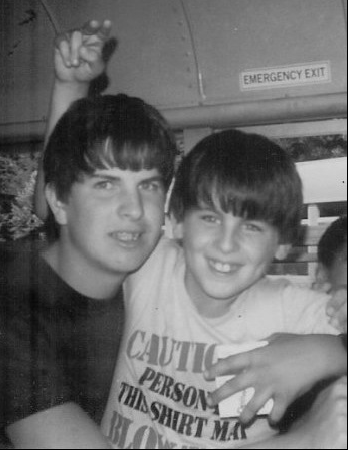 If the question was what did the Berkun brothers do as young boys to gain confidence, the answer was to play basketball, and a lot of it. We could get recognition from teammates, coaches, and anyone else who might watch us play. We went to the garden to watch the Knicks. We played ball anywhere, anytime: in the backyard, in the playgrounds, but most frequently at the local Jewish Community Center, the Samuel Field Y. Our mother, to her credit, encouraged us to get involved there. I, in turn, encouraged Scott to try out for his first basketball team there, an event he discusses as having special importance in his new book. Scott’s making the team was a moment of great pride, not only for him but for me. 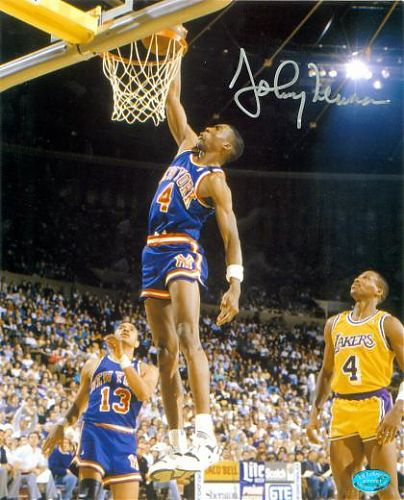 I had first made the Y basketball team in twelfth grade–way too late to really improve and develop my game. I knew that by getting on the team at an earlier age, Scott would have more time to work on his skills. It would give him the chance to become a really good player, a better player than me. Scott knew I was proud of him, but as a family we never seemed to support his basketball effort. Scott made it to starting point guard on the Bayside High School basketball team, a huge achievement by any standard, and I can only remember going to one game. I have no idea how many games the rest of our family attended, but whatever the amount it probably wasn’t enough to make him know we truly supported his effort. Our father had an affair in the late 1970’s. For several years, our parents were separated. In his book, Scott describes his haunting encounter with our father at the front door and mine at a local pizza place during the era. Our father reunited with our mother and came back to live with us in the early 1980’s. The family had its good and bad times, and we assumed that our parents would from then on be committed to their marriage. S cott always seemed to know deep down that he had to get far away from Long Island to find himself and what he was looking for in the world and in his life. No doubt he used his feelings of frustration with the family and our father to fuel his yearning to find himself. I realize that he had to get away, that it was best for him, but for me, I just missed him when he wasn’t around any longer. 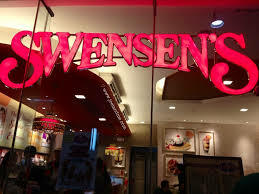 Occasionally we would spend time together, going to places like Swensen’s ice cream at the Miracle Mile togeher. But Scott was soon off to Carnegie Mellon University in Pittsburgh, then out to Washington to work at Microsoft. Now he’s a successful writer and professional speaker. He has achieved an amazing set of accomplishments. I stayed closer to home, went to college at SUNY Stony Brook and met my wife, worked in Manhattan, moved to Connecticut and took over my family toner business. Scott describes how our family separated into two factions. There was my sister who enjoyed having an insulated protective environment created for her by my parents who lived next door. If anything went wrong, they were there to pick up the pieces. Then there was me and my brother who thought the whole thing (living next door to each other) made no sense. My mother would remind my wife and I daily of how much of a model parent my sister was. It was seemingly as if she stated it to us enough, she could somehow make it true. Our sister had never done the work necessary to facilitate her own independence, and our parents not only failed to press the issue, they gave her the means to continue to avoid growing up. It was Scott who never relented in pointing out how destructive my parents’ relationship with my sister and her family was to all involved. It was Scott who had always been the voice of reason, despite being criticized for it. He tried to talk to our sister about the situation, and she responded by refusing to speak with him. She eventually also cut ties with my parents, the ones who had been protecting her were now out in the cold. That set the stage for my father’s second affair and would be the impetus for my brother’s book. Scott called me in the summer of 2012 to tell me we had entered into a family crisis. My father was having an affair; my mother had just found out. It was something I wasn’t ready for, who would be? This crisis would eventually motivate Scott to write The Ghost of My Father. It was 35 years earlier that Scott and I had survived our father’s first affair. That time we had to deal with it alone; this time we were together. Scott handled telling me about it so well, and I was proud of him. But I couldn’t tell him at the time, since there was too much going on. Now Scott has written a book that details his experience in a troubled family and explains what it has been like to have had a strained lifelong relationship with our father. Writing the book is an important step for him; it’s something he felt he had to do, and I am glad he did it. On any level it is a great achievement. He has always been the voice of reason in our family and for that I am forever grateful, and once again, I am proud of him, I will try to tell him this time. I hope you enjoy the book as much as I have. I’ve always been fascinated by roads. Whether it was mapping them, talking about them, analyzing them, or driving them, they always had a unique appeal to me. Much of my wasted youth was spent rummaging through my family map collection, laying them out one by one on the living room floor, and taking imaginary treks out to the far reaches of the maps’ corners. 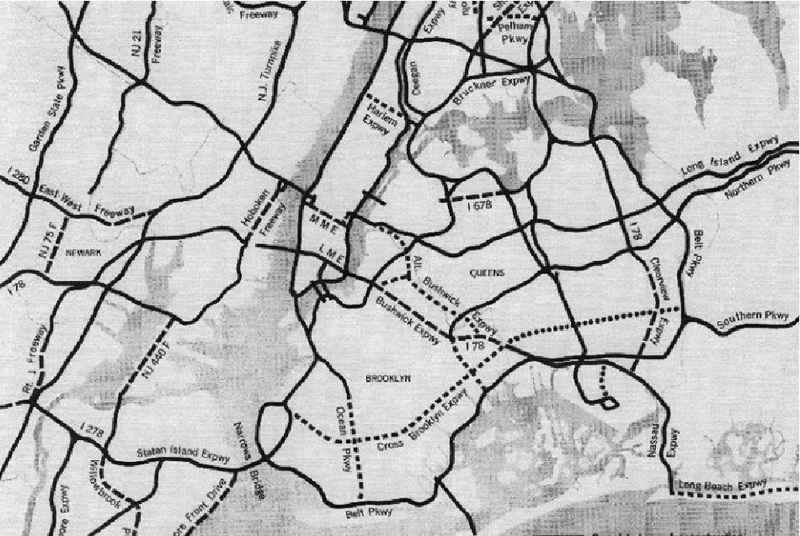 The 1970’s metropolitan New York map offered seemingly endless possibilities. I could head east to the twin forks of the island and imagine myself touching the last piece of land at the end of each one. I could skim the miles of shore parkways and drive endless miles criss crossing the southern barrier islands. I could drive through Manhattan and cross over to New Jersey, riding vast highways and bridges each time. The metropolitan map offered fantasies of miles of trips into and away from the big city. 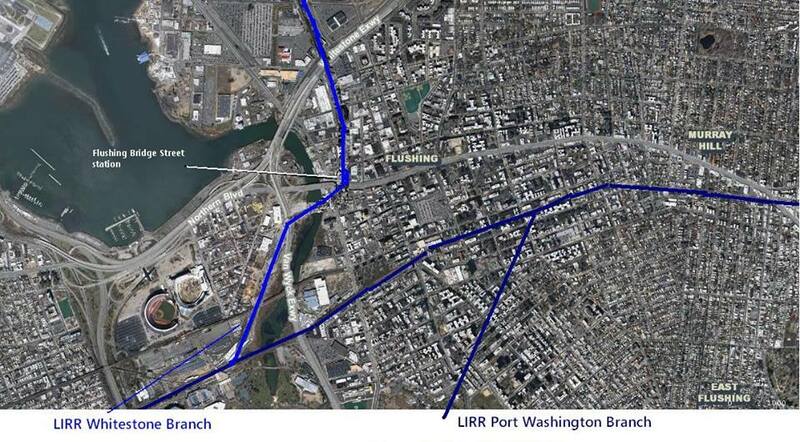 The network of highways around the city is in great part the brainchild of Robert Moses. The New York city planner, coordinator, builder extraordinaire who spent decades laying out these roads is a well known and often polarizing figure. Cast as both hero and villain, he either made the city great or nearly destroyed it depending on your perspective. For me, in my youth, knowing that he had built all these roads, I had always asked myself, how could he not be great? When I was 14, I found out Mr. Moses had passed away. I remember a photo of his hearse slowly taking him down his last highway. The newspapers pointed out how relatively few people were in attendance, but it didn’t really say why. It did seem odd for a man who was such a huge figure. It was from the 1990’s Ric Burns documentary on the history of New York City that I learned of the negative side of the Moses story. The show’s message was that while he was of great benefit to the city during the 1930’s and 40’s, he wasn’t so wonderful in the 50’s and 60’s. Moses attempted to make the city into something it was never meant to be. He rammed wide roads through dense neighborhoods, demolished thousands of dwellings from fragile working class communities in a misguided attempt to clear the city of its slums. In the end he helped make much of the city’s areas poor, isolated and desolate. The most memorable scene for me in the show is an interview with esteemed Moses biographer Robert Caro, shot right over the Cross Bronx Expressway. With the sound of cars and trucks whizzing by in the background, Caro describes what a massive undertaking building this road really was. Subway tracks, sewer mains, utility lines all had to be kept intact while the great road was built right underneath them. 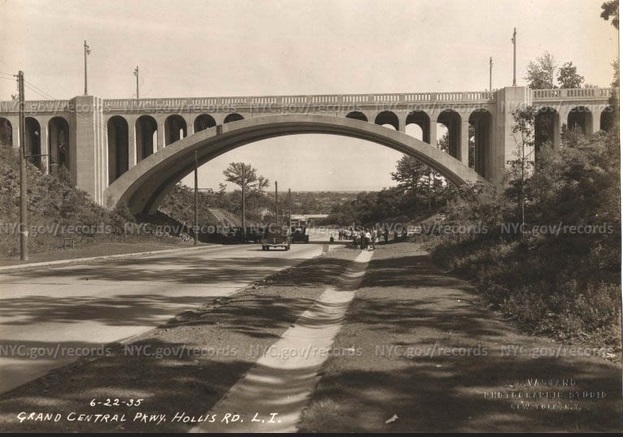 Caro explained that General Thomas Farrel, builder of the famous Burma Road, came out to look at the Cross Bronx during construction and said it was nothing compared to this. 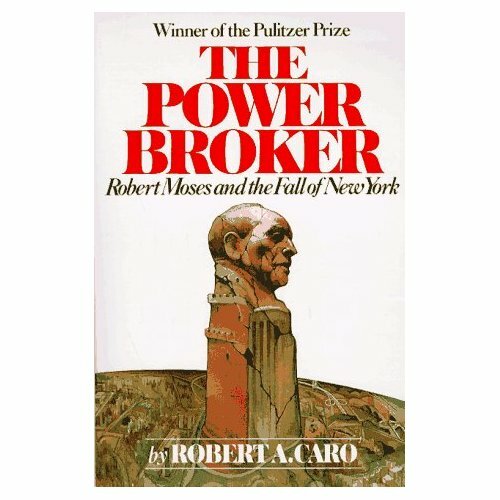 I finally read Caro’s book, The Power Broker, in late 2011. For me, a New York history blogger, it was high time I read the definitive biography of the master builder. The book is eye-opening in terms of what it reveals about Moses; there are countless episodes of injustice and callous cold behavior. I tried to discuss them and Moses’ legacy in an earlier blog entry. But it is my own research that I wanted to talk about here. I wanted to talk about the episodes where my path crossed that of Moses’. Its name is intriguing. 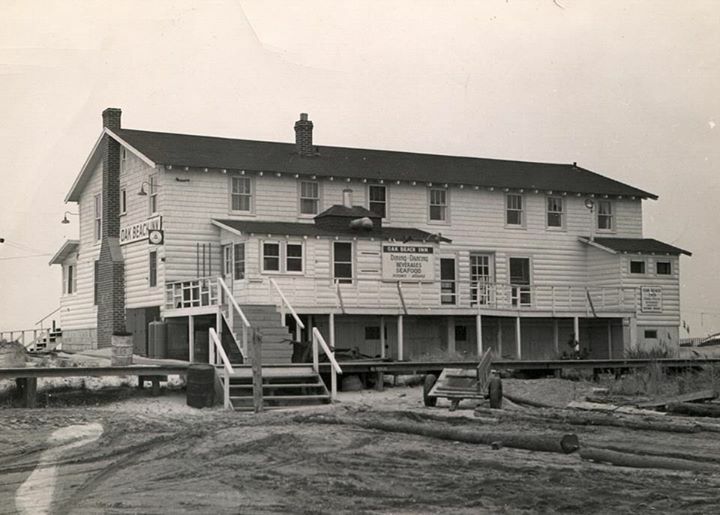 It was a fishing resort town located in the middle of Jamaica Bay. It was thought to be either a Swedish word for fishing area or Dutch one meaning breeding place for ducks. There was no road access to The Raunt. Dwellings could only be reached by foot or boat. There was a train station a little distance from the town, but most people who rode the train said they never saw anyone get on or off at The Raunt. The houses had no plumbing, no modern services at all, and it had become something of a mystery what Raunt life exactly was like. By the 1950’s, the glory days of The Raunt were long since past. Just three small rickety hotels still stood surrounded by a few more houses. It all came to an end in a brokered deal between the transit and parks departments. The city in effect had to sell out The Raunt to the Parks Commissioner Moses in 1953 to get an allowance to build a subway line down to Rockaway. Moses demolished the village completely to put a bird sanctuary in its place. The bird sanctuary was a success, and many will say that establishing a fresh water collecting pond is a better use of the land than a rundown fishing village. But for me, coming to find that such a unique resort town that dated back to the 19th century was now destroyed, I sincerely lamented its loss. When the NYC Department of Records released 800,00 photos from its archives in 2011, there was much history revealed. Photo historians were able to to find great glimpses back into the city’s past. Among the thousands, I found several shots of a beautifully high arched bridge over Hollis Court Boulevard in Central Queens. The bridge took the Grand Central Parkway through Cunningham Park over the boulevard. 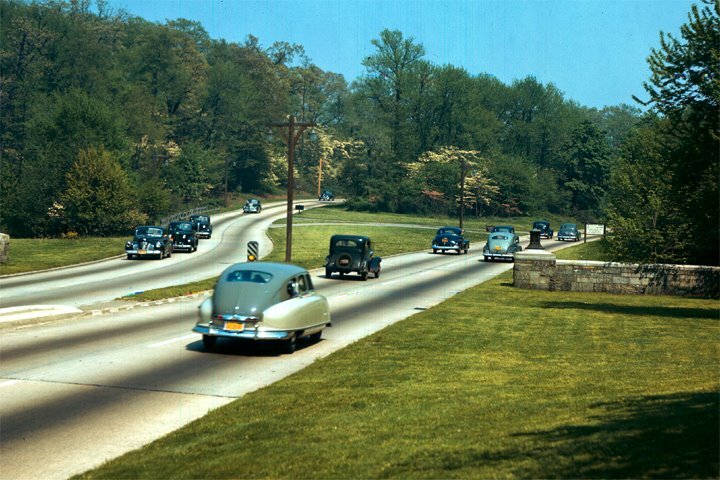 Constructed by Robert Moses in the mid 1930’s, it’s a beautiful example of how a highway can compliment its surrounding area. Caro states that much of Moses’ earlier work was more tasteful than his later, and this bridge is certainly a good example. When Hollis Court Boulevard was replaced by the Clearview Expressway in the late 1950’s, the bridge was taken down and replaced by a much more functionally oriented but clearly less attractive intersection structure. The contrast in style and approach to design is apparent. To know that such a stately bridge once stood there and that now such a basic one is in its place seems to be a loss. 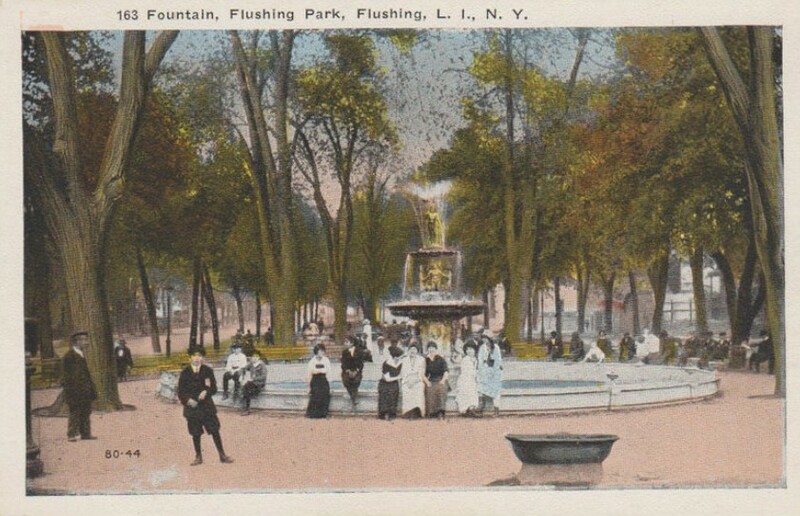 I was asked by author and Queens Historical Society Director Marisa Berman to write a piece on a fountain which once stood on the inner island of Northern Boulevard at Main Street in the center of Flushing and can be seen in photographs throughout the early 1900’s. The fountain was a focal point for folks to congregate. It was built in 1874 to coincide with the instillation of running water for the town. By the mid 1940’s, the fountain was no longer standing, but nobody knew exactly why. When I located a July 1947 newspaper article which reported that in the middle of the night the Parks Department had removed the fountain from its foundation I had my answer. The paper deemed the incident a “Parks Department Murder.” We know from Caro’s detailed work that the Parks Department did nothing without explicit instructions from its comissioner, Robert Moses. So we can assume that these orders came from the top. The RKO Keith’s Theater which stood across the street from the fountain for many years might itself have had a better chance of surviving had the fountain remained in place. Accompanied by a beautiful place to sit and wait, more moviegoers might have found their way back into the theater. To this day, little has been done to replace the area where the fountain once stood. A few benches rest on its space and the theater has remained vacant and decaying since 1987. In comparison to the list of worst infractions by Moses, these three are very small. My point is not what they may have meant for Moses, but what they meant for me. The admiration I once had for the man I felt no longer. I did not go looking for instances of Moses and his oppressive past, I came across them by accident. 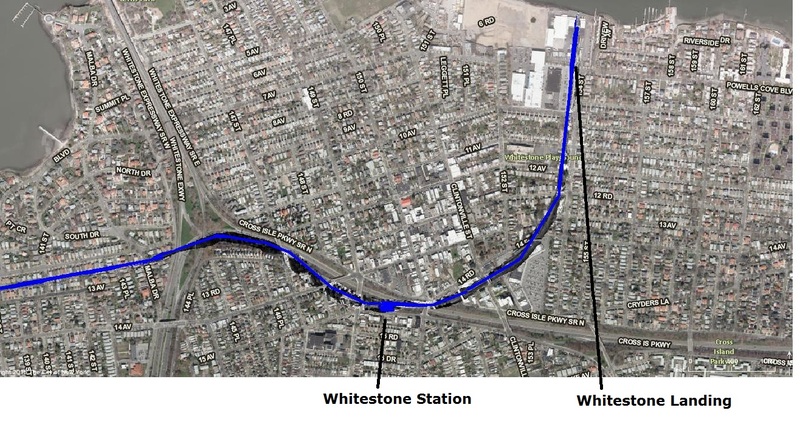 Moses’ often misguided path of dominance and control over the city affected many things. We often try to equate the effect of Moses on a grand scale, but much of what he did over time also added up on the small. When the Town Of Oyster Bay behind closed doors decided to approve the landmark destroying plans for the Maine Maid one hour before its public vote I felt I had to say something. It is impossible to get many of the details because the best coverage of the story seems to be on Newsday’s site, which you can’t read if you don’t pay for their subscriber service. We have enough info to know this is not how things should be. We like to say things have changed and how much landmark preservation has improved since the destruction of Penn Station in 1963. We like to say times are better now for landmarks, but are they really? 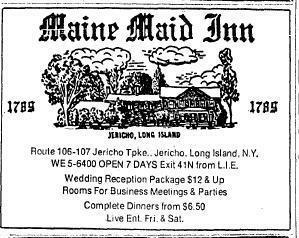 Certainly not if you follow the developments at the Maine Maid Inn. The Inn was given landmark status in 2008, at which time we thought the former underground railroad stop would be preserved. But anyone who fought for the status has to now be wondering why they wasted their time. In what is probably an illegal closed door meeting prior to the public vote, the Town Of Oyster Bay approved already progressing work to demolish the site 5-1, which had begun without any prior notice to the town. In most cases we historic image collectors can never get enough of these old photos, but for anything there can always be too much. Post a cool photo of an old amusement park or ice cream parlor and it seems great. Post it again and those who didn’t see it the first time can get their say. But re-post it a few more times and it starts to get tedious. If the image is very small, or not really so old, or in some other way out of place it can be even more unnerving when it is seen again and again. While there are probably millions of photos sitting out there waiting to be seen, there are a few that wind up posted over and over. I often wonder who originally owned these photos, will these people ever get the credit (or blame) they deserve for bringing them to the worlds attention? Facebook and other photo posting sites tend to draw all attention to the three or four most recent photos to the page, this makes it hard for new people coming in to see the older posts, and they may not realize how many times an image has already been seen. With that said here is my short list of over-saturated over-blogged over-done photos. Where I could I provided a suggestion of where an equal or better photo could be found in its place. 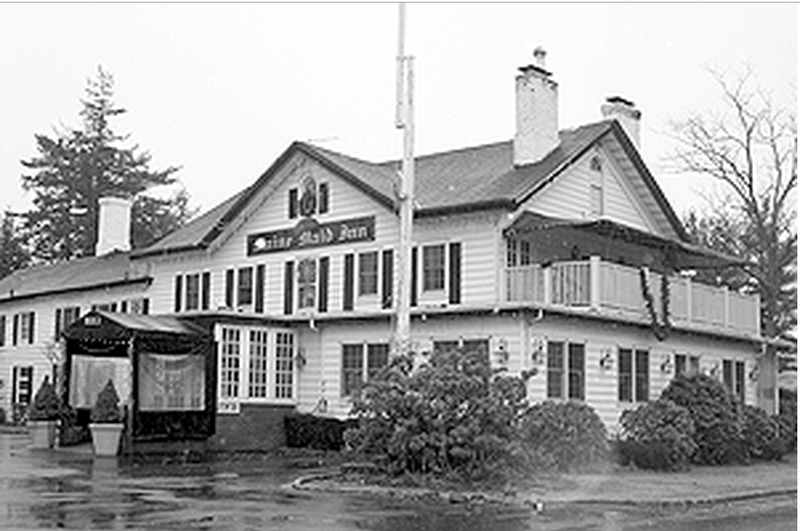 The Oak Beach Inn might be the most famous dance club ever to stand on Long Island, but this black and white photo doesn’t really do it justice. 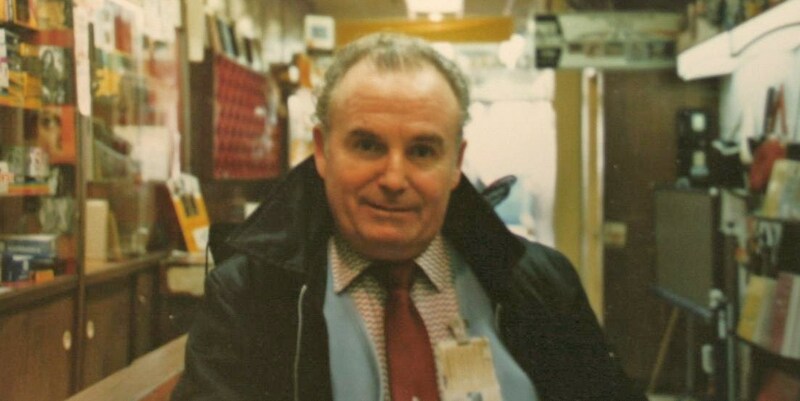 This photo shows its appearance before the infamous Bob Matherson took it over. It is years before the Iced Tea was invented here, years before all the clamor of neighbors and town government to try to and eventually succeed in shutting it down. This shot is available on Wikipedia, and therefore very easy to find and download. In 2010 a Long Island band Two Cent Sam put out a good song called the The OBI Song and dedicated it to the club. The person who made the video clearly spent a good deal of time putting it together. It has images to match up the lyrics, but every time the OBI itself is mentioned we see the same out of context pre 1970’s Wikipedia photo. A shot of a more time appropriate OBI image would have made made more sense and brought more meaning to the video. If you grew up in northeast Queens this was probably an important store to you (and still is today as a Macy’s). 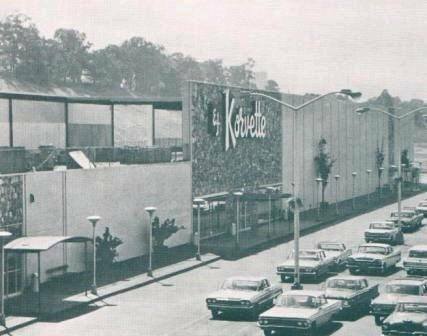 Most Long Island Korvette’s were built in locations that were slightly off the main drags, but not this one, which was built right into the side of a huge sand pit it on a hill and when completed became the only department store east of Fresh Meadows and west of Roosevelt Field. There’s really nothing wrong with the photo, the detail and definition are very good. The stone face facade of the Korvette’s, the lightng of the parking lot, the 1960’s model american cars and all. 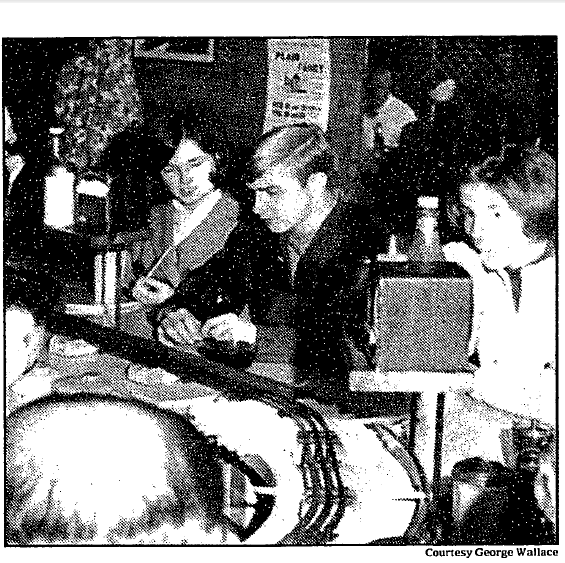 The shot is probably from November 1964 when the store first opened. The problem is there are no other contemporary photos to go along with it, all we have is this one single shot, and so it alone continues to be re-posted. We don’t know if this was part of a series, we have no idea what the source of this photo is at all. 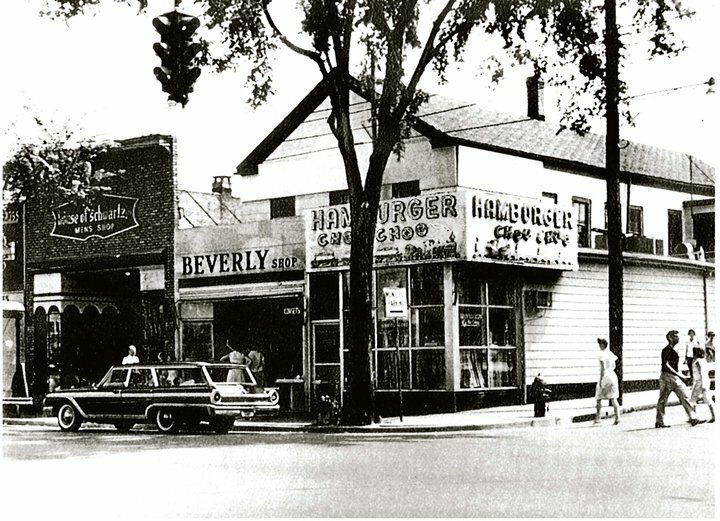 There aren’t many good vintage Korvettes photos and almost none of the Douglaston location. I did just posted one here to offer at least one alternative but it is a shame there aren’t more. This Dugans truck photo, which appears on the www.dugansbakers.com is a current photo of an old vehicle. We continue to see this same photo over and over. It would be nice if we could even get a new different photo of this same truck. much less a truly original vintage milk truck photo. The same applies to any recent photos of any old vehicles. Once is fine, but to keep re-posting these is more than needs to be seen. It would be greatly preferable to see vintage photos of these trucks in their heyday,or at least find us fresh ones of these vehicles. I found and posted a vintage Dugan’s truck photo from Long Island historical site spoonercental.com at the fan page here. 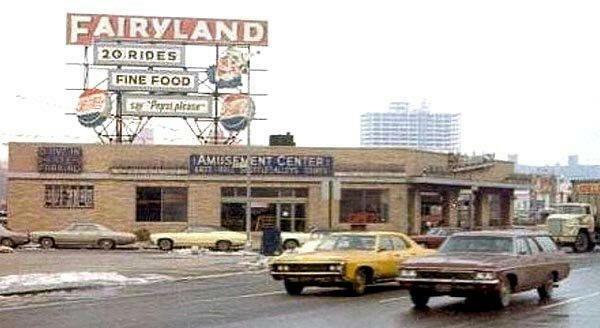 Fairyland was an amusement park in the 1950’s and 60’s on Queens Boulevard in the space that is now the Queens Center Mall (not the Queens Place mall which is two blocks up although if you google queens center mall you get a picture of the Queens Place Mall. It’s not easy to find old small local amusement park shots from back in the day, so the few that are in circulation tend to get re-posted frequently.There is no other good photo of Fairyland from the outside, and probably as a result, this shot shows up again and again. The facebook group devoted to Fairyland is similar to other area amusement park groups. A look at its photos reminds us that something that is missing from the amusement park of today. For most of Long Island, the days of sharing the short trip to the local amusement park with neighbors is gone. The rides seem to be a something of a given today, while back then they still felt like more of a privilege. It’s a shame more of us didn’t take photos of these precious moments when we had the chance, (although taking photos wasn’t nearly as easy as it is today). If you get out to adventureland or get your kids on any other rides at area carnivals, don’t forget to bring your camera and try to get some good shots of the kids on the rides, you’ll probably want to look at them again one day. I never personally ate from the Chow Chow cup truck. 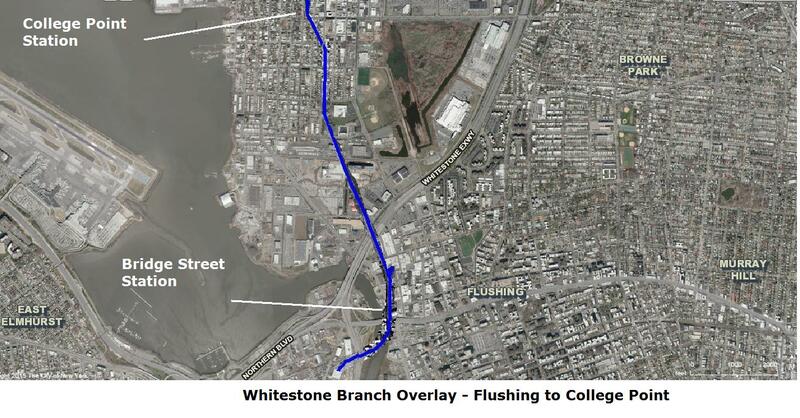 so far as I know, they never made it to northern Bayside (Bay Terrace) in my day growing up there. But I can say I’ve seen the one in this photo at least a hundred times. The problem with this and a lot of other photos on the page is, who would ever have thought we would one day want to see a photo of things like an area food vendor truck. Film was expensive, we didn’t have digital cameras, so who would want to ‘waste’ their money. The only other photos I could find of the truck was on this page, which happens to have right click and save disabled, (making it harder to re-post). Hey, it looks like the truck may have made it all the way up to Woodstock. The fact that there are more and more growing pages and web sites devoted to old photos and history probably only means that these and others like them will continue to be posted and posted once more. I may not want to see these photos again but I just posted them all one more time myself. And they wouldn’t get posted at all if they didn’t evoke some personal and shared memories. So if you have any good photos of these places or ones like them, please don’t hesitate posting them on the places no more page, or group. Maybe the images above wont go away, but perhaps we can continue to find others to go along with them, and ones like these will be posted a little less frequently. And Dont Forget About Our 2014 Calendar! Just a reminder that we are presenting vintage photos (which have not been posted as much :-) in our places no more 2014 calendar, proceeds going to help Long Islanders in need. 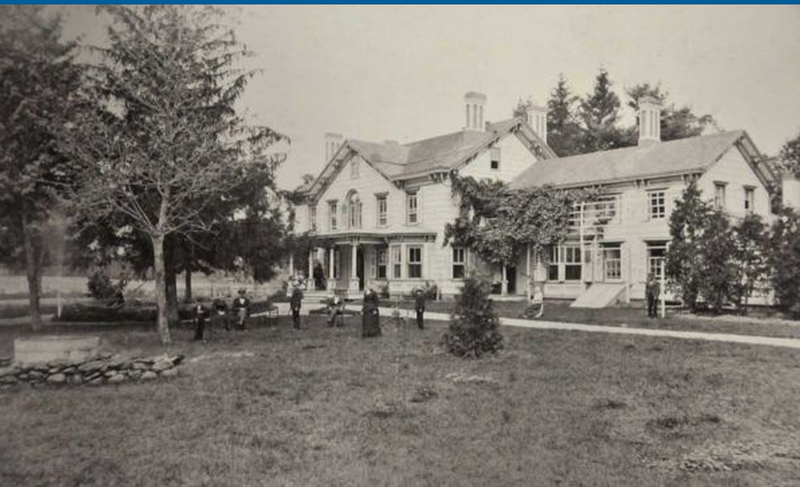 The 2014 LI Places No More Calendar is here with a new series of historic photos. The calendar provides a unique trip down memory lane and is a great gift for anyone who is an old-time New Yorker. It is also a gift that does more giving. We are making a contribution to help Long Islanders in need. With each sale half of the proceeds of the 2014 Places No More Calendar are going to help the victims of Hurricane Sandy with a contribution to Long Island Harvest. We did the same with last year’s calendar. January – Catskill Game Farm Although not on Long Island, the game farm is a cherished memory for many. Originally opened by the Lindemann family as a retreat in 1933, in 1958 it was recognized by the Department of Agriculture as the first privately owned zoo. (Beth Hague / Reference Librarian Catskill Public Library.) Closed since 2006, the new owners of the land are trying to reopen the farm, their facebook fan page is here. Schaefer was the world’s bestselling beer for much of the 20th century. Many people in the area worked for years at its Kent Street brewery. The photo reminds us of Schaefer’s time as a force in the beer industry. Photo by Anthony J. Rinaldi. His grandaughter continues in the tradition of pursuing art as an artist fb page here. The sign was neighbors with the West Side Highway for years. It stood at 39th Street and 12th Avenue. It was built to look like it was about to merge right onto the elevated highway. The name on the old sign had stood for Yale Express Systems, once a major regional trucking company that teetered on the brink of bankruptcy through much of the 1970’s before collapsing into insolvency. But the truck came back under United Rentals who restored its lights and finish. It had a renaissance of sorts in the mid 2000’s, only to meet its final demise when the Javitz Center took it down in 2007. The Worlds Fair in 1964 was one of Robert Moses many so-called last stands. By the late 1950’s, the media and public was becoming more aware of the darker side of Moses, and his presidency of the fair represented an attempt to not only improve his public image, but gain some financial security for himself, something his public service salary had never truly afforded him. In the end the fair did not turn out to be a money maker, but its many pavilions and rides are a cherished memory to many who remember attending in their youth. Matthew Silva has taken the lead in trying to restore one of the landmarks from the fair that is still standing, the New York State Pavilion. He is hoping to restore it before it collapses to the ground. His facebook page can be found here. May – OTB – OTB’s were usually smoke-filled, crowded, stuffy places with blurry screen views of the races showing the horse you bet on losing. OTB’s are blamed for helping contribute to the demise of area tracks like Roosevelt Raceway. Yet they still made their contribution to area history. The Daily Racing Form lamented their loss and looked back on the history of the city OTB’s here. June – Texaco Service Station – taken in late 1970’s by Michael Joedicke. The Texaco station reminds us of the days of free window cleaning, oil checking, and road maps–all of which you could expect to find at the area gas station. Today a road map is $5 and if you are lucky you can use the water and cleaner to wipe the windshield yourself. July – Good Humor Ice Cream – Takes us back to the days of playing ball on the street, riding bicycles with baseball cards in the spokes, and running to catch the Good Humor man as he came driving down the street. If times truly were simpler in the past, it is because of moments like those shown in the photo. August – World Trade Center by Mark Forman – It is hard not to notice the Flatiron in the foreground, which has stood for over 111 years in Manhattan, or The World Trade center, which stood for less than 28. September – World Trade Center by Anthony Rinaldi reminds us how far the Towers could be seen. 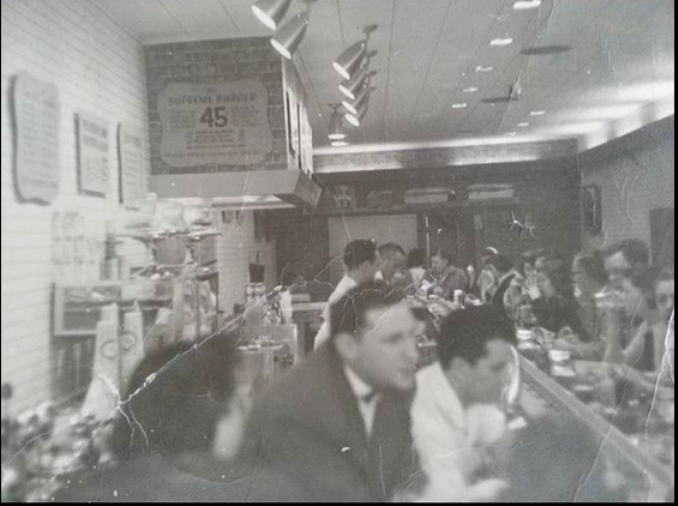 October – RKO Keiths Flushing photo via Anne Downey Wright whose father was a manager of the RKO Keith’s in the 50’s. Chris Kellberg has led the effort to restore the slowly decaying theater with his facebook group here . 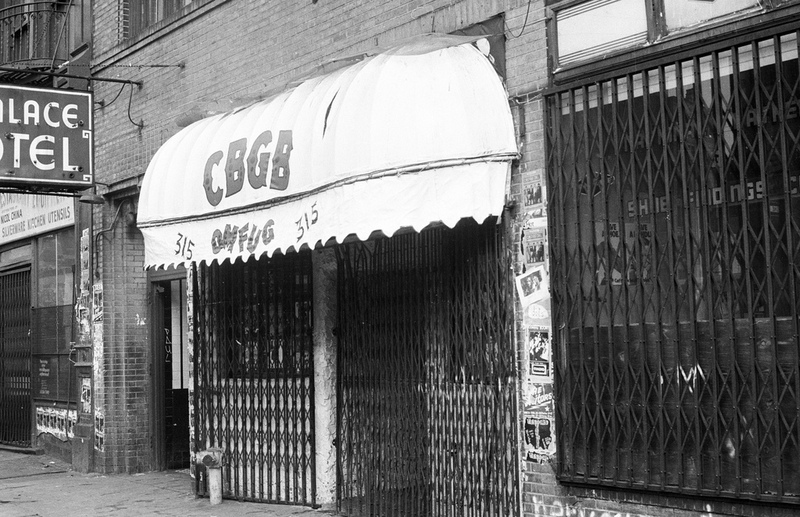 November – CBGB became the center for new music in the late 1970. The Ramones, Talking Heads, Blondie, and so many others changed the face of music with their stints at the club. December – Sam Goody along with Record World and Tower Records were some of the most popular places to find new music. Back Cover – World Trade Center by Suzanne Barse shows the recognizable geometric pattern of the facade of the lower floors of the towers. I included several notable dates in which area attractions opened for business, such as the first Automat, the Levittown Roller Rink and the Nassau Farmers Market. 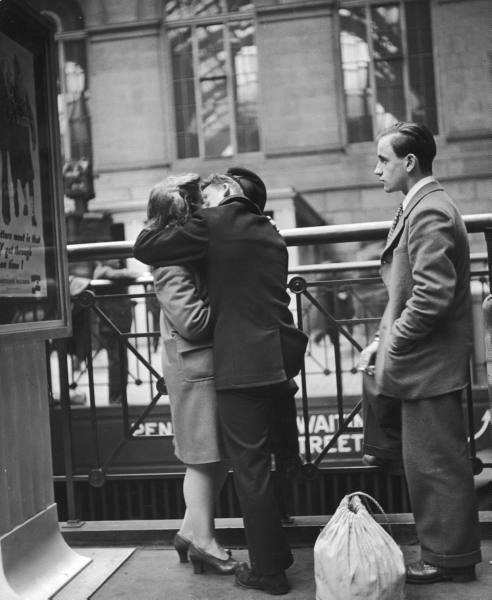 The candid photo below of a sailor kissing a girl goodbye in Penn Station during World War II was part of a famous series of shots taken by photographer Alfred Eisenstaedt for LIFE Magazine in 1943 and ’44. The magazine only provides the names of about five of the 24 couples. Since the time they appeared in print, nobody has ever known what happened to anyone in them. It is their uncertainty that makes these shots so compelling. We are pulled in emotionally by their ability to convey the fear and worry of these brave individuals at the time. The servicemen were risking their lives and answering the call to duty. Perhaps every one of the men going off to fight did make it back, we just don’t know for sure, there is no record. On the left is Fred McDow kissing Ethel Huseland before leaving to go back into service in the navy. I was able to track down the McDow family, Fred’s wife Mary, and younger brother Robert, who still live in New Jersey, and found out what happened to him. We now know that he survived the war and went on to live a wonderful life. In 1944 he lived in Jersey City, and Ethel wasn’t really his girlfriend. Wife Mary explained that she and Fred were sweethearts from the start and never had any other serious romantic involvements. Mary suggested that Ethel may be the girlfriend of the other gentleman in the photo, which she thinks is why he appears so uncomfortable. McDow fought in the Philippines aboard the USS Pennsylvania. He stayed in the Army until 1948, then tried the Merchant Marines before returning to graduate from Dickinson High School in Jersey City. He had gained enough knowledge of air conditioning refrigeration systems to get a job with York refrigeration, but when a similar job opened up at the Port Authority Fred seized the opportunity to work there. He went on to earn a degree at the Newark College of Engineering. Fred did a second round of duty with the Navy during the Korean War. He married sweetheart Mary in 1950, and when the war was over, was assigned to the cooling systems of the George Washington Bridge. The famous 1944 photo of Fred McDow is taken at one lost iconic landmark, Penn Station, while most of his career was spent in charge of another, the World Trade Center. Once the towers were completed, Fred was assigned the position of Maintenance Supervisor of heating and air conditioning where he remained until his retirement in 1993. Fred and Mary had three children, Doreen, Sharon, and Fred Jr., and they all have families of their own. Fred, or Mick as he was often called, was an enthusiastic and active member of several veterans organizations. He became the president of VFW post 9503 in Berkley Township. He was eventually granted membership into the prestigious Cooties 95 Pine Ticks Lodge of New Jersey. Its uniform of a bright red jacket, tie, and hat made Fred look like the “grand high exalted mystic ruler” out of the Raccoon Lodge of a Honeymooners episode. Fred never gave up his love for the sea; he owned boats and went on frequent weekend outings. Fred started to lose strength and his vibrancy and passed away in 1998. 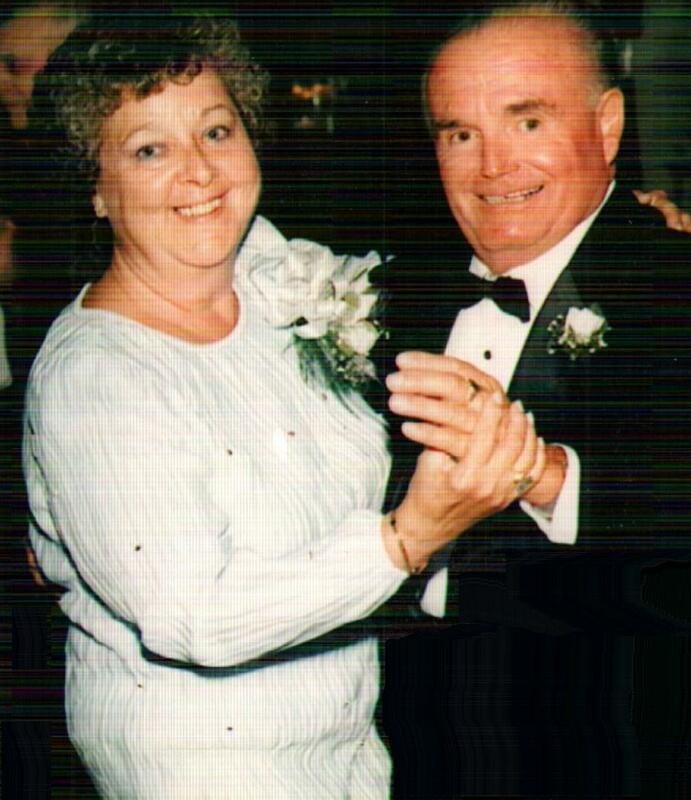 Brother Robert and wife Mary feel their own special loss with the World Trade Center now gone, as it was such a part of Fred’s life. Robert thought his family probably knew about the 1944 photo when it first appeared in LIFE Magazine and that they held on to it for a few years after. He suspected that it was eventually just left behind and forgotten about during one family move or another. They were very proud of Fred and his life, and were happy to have the chance to explain to me his list of detailed accomplishments. This is but one story, one photo among 44, taken by Eisenstaedt in Penn Station and published. He was capturing a tiny fraction of the forced separations brought by the war. Most thankfully saw their men return from war, some unfortunately did not. It is with that uncertainty in mind that these photos draw us in and make us curious to know how these heroes lives turned out. We will never know what happened after all the difficult goodbyes, but at least in the case of this one, we have the answers. My previous entry on this Eisenstaedt Penn Station Photo series is here. Many thanks to Fred McDow’s wife Mary, his younger brother Robert, and Robert’s wife Helen for sitting down and talking with me and to Mary for writing several pages about Fred. Without their help, this story would not have been possible to tell. August 14, 1945, VJ Day, the day Japan surrendered in World War II, is probably one of the most historic days for our nation. We were at least for a moment at peace. Word spread through the streets and people rushed out to celebrate. Whether or not anyone was aware of the looming cold war probably didn’t matter much at that second. Whatever was to come was unimportant on August 14, 1945. This was a day Americans had been yearning for for almost five years and it had suddenly come; it was simply a time to be joyful. The photo that has come to epitomize the day is that of the sailor kissing the nurse as taken by esteemed LIFE magazine photographer Alfred Eisenstaedt. While the picture itself is considered iconic, it also inspired a great photographic mystery: who is really in the photo? Since Eisenstaedt didn’t get the names of the kissers, it was not documented. Anyone could come forth and make a claim to be in the picture. As a result, at least three different women and 11 different men have at one time or another made seemingly legitimate claims to be one of the two in the photo. In 2005, the Mitsubishi Electric Research Laboratories (MERL) in Cambridge, Massachusetts, extensively examined the height, weight, and facial features of the sailor and nurse to make the determination that it was at Navy Quartermaster George Mendonca kissing nurse Gretta Friedman. In 2012, the book The Kissing Sailor by George Galdorisi and Lawrence Verria was published, detailing the lives of Mendonca and Friedman. Two years earlier in April 1943, Eisenstaedt had walked into Penn Station to capture a much more ominous and somber mood. He photographed men kissing their loved ones for possibly the last time as they went into service for their country during wartime. Their embraces were caught with Eisenstaedt’s always captivating photographic eye in uniquely touching and emotional images. These were people in love who did not know if they would ever be reunited to build the dream of a life together or be eternally separated and left with only thoughts of what might have been. 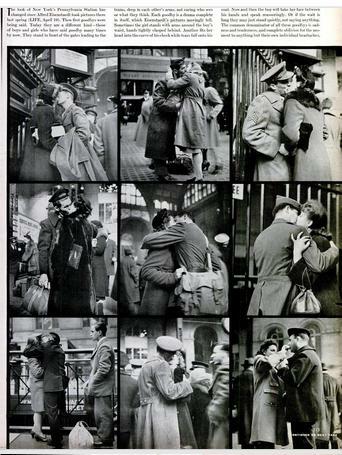 LIFE published five Eisenstaedt Penn Station farewell kisses in its April 19, 1943 issue. The uncredited article in the piece stating “neither Eisenstaedt or his candid camera were noticed as they recorded these little dramas of women saying goodby (sic) to the men they love.” The issue also included shots of nurses, mothers, and women in the service as they, too, waited for trains with nervous, pensive expressions on their faces. In the end that was all there seemingly was to this story. We have the legacy of these touching photos, but we also do not know what happened to these people after the pictures were taken. Like the VJ day photo, we have a photographic mystery. The suspense and uncertainty that we see in the couple’s expressions still hang over us because we do not know what their endings were. It was with that in mind that I decided to find out what happened to at least one of the people in these photos. I didn’t have much information–of the 24 pairs pictured in both issues, only five couples’ names are provided in the text. This is probably because as the first issue stated, the photographer went virtually unnoticed. And so it was with the five sets of names that I set out on my search. From the beginning, I could not find any trace at all of three sets of the names–nothing in any census or any database at all. Who knows if these three gave Eisenstaedt their real names and if he wrote them down correctly. I did get a match on a fourth set but the trail ended with a Queens death record from 1985 and a corresponding one-line obituary in The New York Times that did not mention any surviving family. And so I was only left with names from number five. I found a matching last name in a phone listing in New Jersey of a sailor shown on the second page of the 1944 series. I made a call and it was returned. 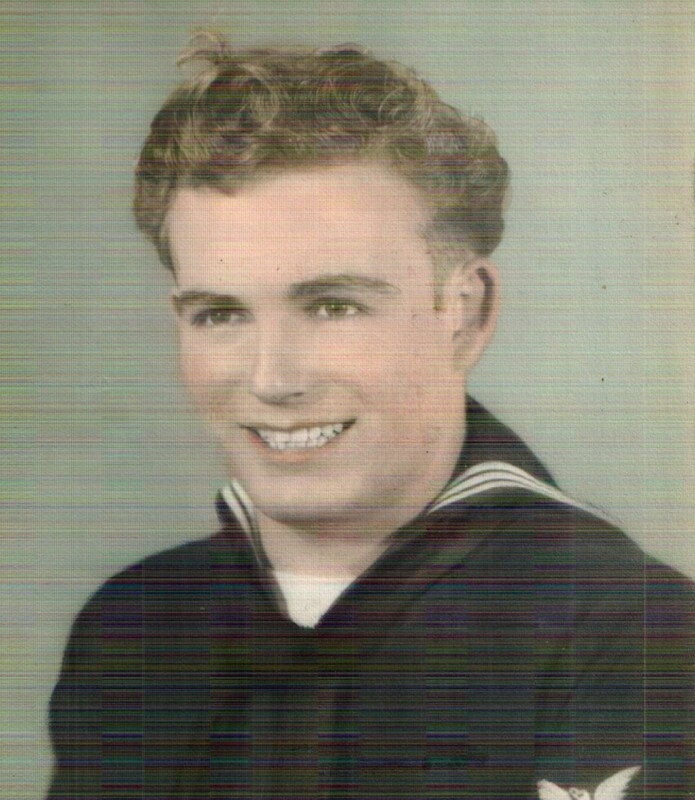 It was this sailor’s younger brother, who was happy to speak with me about his sibling; I had made a connection at last. I now know that the sailor did return from the war, that he settled down in New Jersey and raised three children with his wife. He had a successful career working mostly for the Port Authority and worked in of all places, the Twin Towers of the World Trade Center. He lived into his 70s and passed away in 1998. He did not marry the woman with whom he is pictured in the photo, but a woman he had known since childhood. I have since met his wife and spoke with her about her husband’s life. I was able to put the pieces of his life story together, and I’ll provide that story in an upcoming piece. There were twelve Dairy Barns still standing in March, there are now seven. It happens something like this; at the end of the day a long standing Dairy Barn location closes seemingly just for the night, but instead, a strange transformation takes place. A similar yet somehow different store called The Barn opens in its place the next day. The new store looks almost like the old, but it is not. It has new ownership, new employees, new offerings, and is non unionized. People can buy milk and staples and snacks, but it is not the same business. This has been happening on the average of about one store a month for the last three years, and only seven Dairy Barn’s now remain. At some point, probably early next year the last one will go and there will be none left. The company that in 1961 invented the concept of drive through grocery shopping will be no more. The change from Dairy Barn to The Barn … many people don’t even notice anything is different. Not that long ago, as recently as 2005, the New York Times was writing up glowing reviews of the then 51 store Dairy Barn franchise which seemed to only drive home the point that things were just rolling along as they always had been for 45 years at Dairy Barn. The owners, the Cosman family, were enjoying things, they were in a business they had been in for a long time, and nothing seemed to change much in their lives. It was a stable place to work. Other than ownership considering the addition of a few frozen meals produced by local area merchants, there was really nothing much going on at all. How things have changed. As early as 2010 rumors started flying, people who knew something was wrong were looking for jobs elsewhere, and insiders were spreading word that it might be a good time for everyone to leave. There still remained almost 50 locations open, the new Barn stores were just a blip on the radar screen. If you looked around on the surface you wouldn’t know anything was wrong, but in back rooms the message was different, it was time to get out. So why the change in course? Well it’s not easy to tell the answer for sure. The Cosman family still isn’t speaking, and nobody else in management wants to talk either. All attempts to approach the company for a comment have been rebuked. We only know they have decided to end the business their patriarch father Dieter Cosman so ingeniously initiated in the early 1960’s. The motivation is probably money, and a lot of it, on a real estate deal, which they hope to get for the sale of their biggest asset, their plant the Oak Tree Dairy milk production facility at 544 Elwood Road in East Northport. Dairy Barn /Oak Tree announced in March 2012 their intention to sell and close the 37 acre plant property to developer Engel Burman who would then build a two story, 482-unit condominium community for age 55 and over owners on the site. Known as The Seasons at Elwood, the units would cost somewhere between $400,000 and $500,000 each. No price sale for the entire plot has been disclosed, but you have to imagine it would bring the Cosman’s into more money than they could ever dream of from running a dairy farm. The only reason Dairy Barn ownership has made any comment to anyone at all about their intentions is because they have been forced to. Oak Tree needs to get the town to implement a zone change from R-40 to R-RM to make the sale acceptable to Engel who needs to redevelop the property into smaller plots which current zoning will not allow. 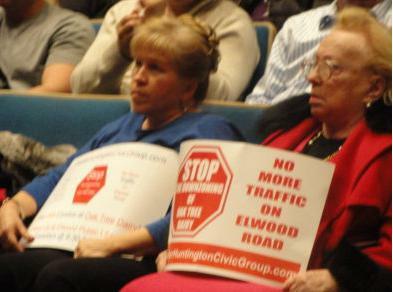 But residents of Huntington and Northport have been vigorously opposing that change since the proposed sale was first announced in March of 2012. Their pressure has been making it hard for town officials to even consider the zoning move at all. While it may or may not be a no-brainer, what should not go unnoticed is that Singh revealed that Dairy Barn has been working on the deal for at least three years. That would take us back to late 2009; back to about the time the Dairy Barn made that mysterious turn in direction, back to about the time they started to close all those stores. No doubt the folks at Dairy Barn knew the offer from Engel was coming and there already was some form of silent agreement in place. Singh’s words did little to sway any public opinion, and so Diary Barn instead decided to move to its dreaded ‘plan B’. This was the implementation of a heavy handed approach to get people to see things their way. Oak Tree intended to ramp up production at Elwood so high as to hopelessly congest and annoy the towns residents into surrender. They wanted to crowd the town with milk trucks going in and out of their plant and up and down narrow Elwood and Cuba Hill Roads and force residents to see that they had no choice but to succumb to Oak Tree’s wishes. It’s hard to imagine people thinking they would be better off gaining a few thousand new 55 plus year old neighbors than having a few noisy milk trucks in their way. It’s hard to imagine they would find the trucks more irritating than a few hundred new frantic grocery shoppers at the Path Mark at Dix Hills Plaza on a Saturday morning or on the fourth of July. It was hard to imagine it happening and it didn’t happen. In the end the community was not bullied into anythng. The whole process probably just made them more defiant and united in their cause. It also did little to improve Oak Tree’s public image with anyone. Newsday reported on July 18th, 2013 that officials have all but rejected Burnam’s current development plan, sending it back to them with a request for a revision with less units before it will look at it again. Even after it is revised and sent back in, there are no guarantees. The resistance continues to fortify its stand and the protest is likely to start up all over again when the proposal comes back. 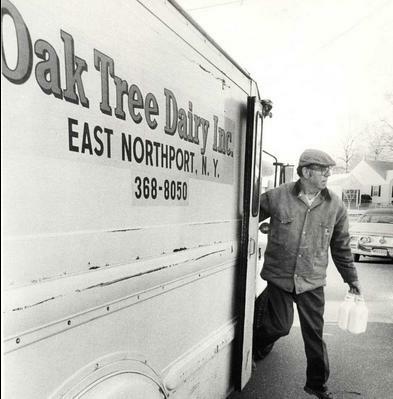 In some ways the Oak Tree Dairy can be seen as a victim of its own success. For years it thrived by marketing itself as the only remaining dairy farm on Long Island. It was playing up to the sympathetic ears of Long Islanders who had grown unhappy about the progressive loss of their once productive and spacial farmland, who now didn’t want to see this last farm go. After decades of having to stand by all too idly while farm after farm was sold to capitalistic opportunists who converted them into crowded condos and apartments, maybe this time the people of the island, their roads and communities, crowded and stretched to the limit, have had enough. Maybe this time they are going to stop the last dairy farm from fleeing and not let it be turned into one more crowded development. One last thought, the owners of Dairy Barn might consider making at least one new hire, a good PR firm. To date Dairy Barn has done just about everything it can to alienate the town, its people, its officials and its own cause. Trying to extort and beat someone into submission is not the best tactic to convince anyone to do anything. This may work in totalitarian governments, but not in democracies. A better plan; try negotiating with the people and hear what they want. For continuing developments on this story stay tuned to my places no more facebook page and this blog. My earlier story on Dairy Barn closings is here .